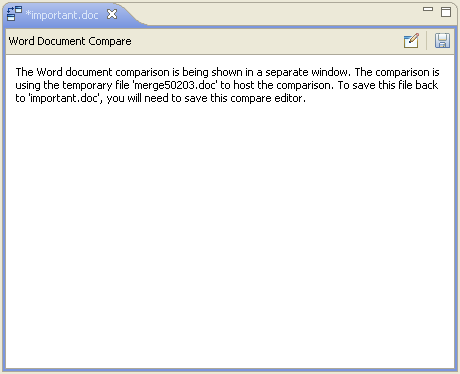 One this page, we describe support for comparing Word documents using Eclipse. The purpose of this page is two-fold. 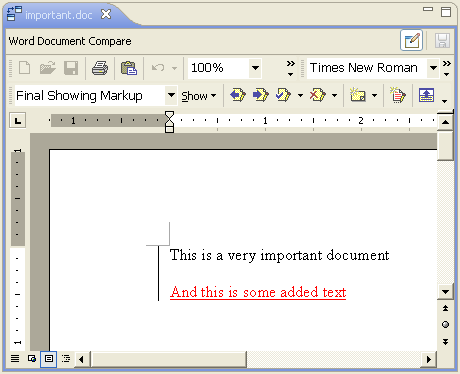 First, we will described the goals and features of the Word Document compare support. After that, we will dig a bit into how we integrated the Word comparison with the Eclipse Compare framework. We will now look at how to integrate a compare merge viewer into Eclipse. First we'll discuss the extension points we need to extend and then we'll discuss the compare viewer implementation. However, we are not going to look into the OLE portion of the viewer. getLeft() and getRight for getting the two sides of the comparison. There is also a getancestor() that is used when the comparison is 3-way. That is the essence of the code we need to open populate the Word document (except, of course, for the OLE code but we are not going to go into that here). The only remaining part is how to write any changes back into the compare input.